Promptly remove the patient from continued exposure and immediately institute oxygen therapy with a nonrebreather mask. Perform intubation for the comatose patient or, if necessary for airway protection, and provide 100% oxygen therapy. Institute cardiac monitoring. Pulse oximetry, although not useful in detecting carboxyhemoglobin (HbCO), is still important because a low saturation causes even greater apprehension in this setting. Give notification to the emergency department for comatose or unstable patients because rapid or direct transfer to a hyperbaric center may be indicated. If possible, obtain ambient carbon monoxide (CO) measurements from fire department or utility company personnel, when present. Early blood samples may provide much more accurate correlation between HbCO and clinical status; however, do not delay oxygen administration to acquire them. Obtain an estimate of exposure time, if possible. Avoid exertion to limit tissue oxygen demand. Cardiac monitor: Sudden death has occurred in patients with severe arteriosclerotic disease at HbCO levels of only 20%. Pulse oximetry: HbCO absorbs light almost identically to that of oxyhemoglobin. Although a linear drop in oxyhemoglobin occurs as HbCO level rises, pulse oximetry will not reflect it. Pulse oximetry gap, the difference between the saturation as measured by pulse oximetry and one measured directly, is equal to the HbCO level. However, pulse CO-oximetry units are available that can screen for CO toxicity at the bedside. Continue 100% oxygen therapy until the patient is asymptomatic and HbCO levels are below 10%. In patients with cardiovascular or pulmonary compromise, lower thresholds of 2% have been suggested. Calculate a gross estimate of the necessary duration of therapy using the initial level and half-life of 30-90 minutes at 100% oxygen. In uncomplicated intoxications, venous HbCO levels and oxygen therapy are likely sufficient. Evaluate patients with significant cardiovascular disease and initial HbCO levels above 15% for myocardial ischemia and infarction. 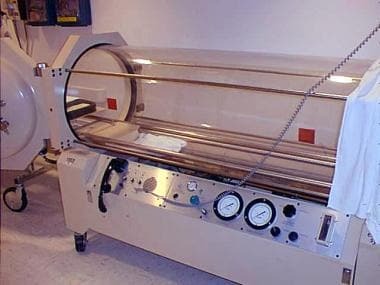 Consider immediate transfer of patients with levels above 40% or cardiovascular or neurologic impairment to a hyperbaric facility, if feasible. Persistent impairment after 4 hours of normobaric oxygen therapy necessitates transfer to a hyperbaric center. Pregnant patients should be considered for hyperbaric treatment at lower carboxyhemoglobin levels (above 15%). Complicated issues of treatment of fetomaternal poisoning are discussed in Special Concerns. Serial neurologic examinations, including funduscopy, CT scans, and, possibly, MRI, are important in detecting the development of cerebral edema. Cerebral edema requires intracranial pressure (ICP) and invasive blood pressure monitoring to further guide therapy. Head elevation, mannitol, and moderate hyperventilation to 28-30 mm Hg PCO2 are indicated in the initial absence of ICP monitoring. Glucocorticoids have not been proven efficacious, yet the negative aspects of their use in severe cases are limited. Do not aggressively treat acidosis with a pH above 7.15 because it results in a rightward shift in the oxyhemoglobin dissociation curve, increasing tissue oxygen availability. Acidosis generally improves with oxygen therapy. In patients who fail to improve clinically, consider other toxic inhalants or thermal inhalation injury as contributing factors. Be aware that the nitrites used in cyanide kits cause methemoglobinemia, shifting the dissociation curve leftward and further inhibiting oxygen delivery at the tissue level. Combined intoxications of cyanide and CO may be treated with sodium thiosulfate 12.5 g intravenously to prevent the leftward shift. Admit patients to a monitored setting and evaluate acid-base status if HbCO levels are 30-40% or above 25% with associated symptoms. Hyperbaric oxygen (HBO) therapy currently rests at the center of controversy surrounding management of CO poisoning. Increased elimination of HbCO clearly occurs. Certain studies proclaim major reductions in delayed neurologic sequelae, cerebral edema, pathologic central nervous system (CNS) changes, and reduced cytochrome oxidase impairment. Abnormal neuropsychiatric test results (91%). Ninety-two percent of HBO facility directors use HBO for headache, nausea, and HbCO levels above 40%; yet only 62% have a specific minimum HbCO level in asymptomatic patients. One half of the centers place a time limit on delay of treatment in patients with transient loss of consciousness alone. HBO at 3 atm raises the amount of oxygen dissolved in the serum to 6.8%, enough to sustain cerebral metabolism. Elimination half-life is reduced to 15-23 minutes. Elimination half-life of CO from methylene chloride intoxication of 13 hours at room air temperature is reduced to 5.8 hours. Chambers are small monoplace hulls, allowing space for a single patient in a supine position who can be viewed through a window at the head, or they are acrylic walled and allow full visualization. Many of these monoplace chambers allow for care of critically ill patients, including intravenous lines, arterial lines, and ventilator. Others are large multiplace chambers that permit ventilation equipment and allow medical teams to accompany the patient. A monoplace chamber is shown below. Complications of therapy include decompression sickness, sinus and middle ear barotrauma, seizure, progression of pneumothorax to tension pneumothorax, gas embolism, reversible visual refractive changes, and complications related to transport of unstable patients. For treatment of complications from therapy, decongestants are useful, prophylactic myringotomy is common and a requirement for intubated patients, and chest tube placement is mandatory with pneumothorax. Exercise caution in patients who have experienced chest compressions, central venous catheterization, intubation, and positive pressure ventilation. Seizures are most often secondary to oxygen toxicity and do not mandate anticonvulsant therapy or discontinuation of HBO therapy. In multiplace chambers, seizure therapy consists of removing the oxygen mask. In monoplace chambers, decompression lowers oxygen concentration. It is crucial not to do this during the tonic phase of the seizure because it may cause pulmonary barotrauma secondary to gas expansion in the lungs.